When Bev Holczman started working at Caeronnen, a care home in West Wales, she was more than happy to abide when tenant Angela Hurrell asked if she could draw something for her to colour in. “Angela has mild learning disability and mental health issues and finds art a rewarding outlet", says Bev. "As soon as she gets used to you, Angela always asks people if they can draw because she loves colouring in. She’s very good at it. "She mainly uses colouring pencils or felt-tips, but she enjoys other craft activities as well such as collage." The care home also supports Angela in exercising her creativity in a different environment through attending HUTS (Helping Us to Survive) workshops in Newcastle every week. 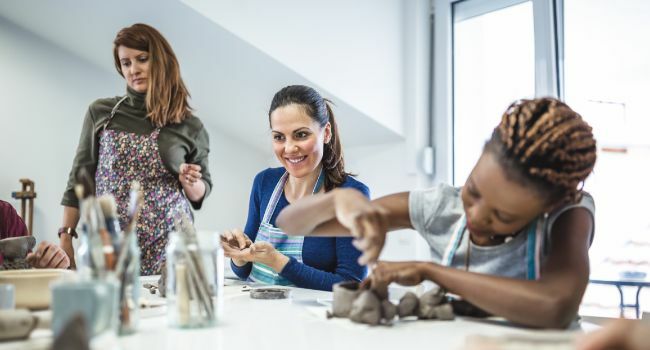 The workshops, for people with learning disabilities and mental health problems, give participants opportunities to experiment with pottery, woodwork, jewellery making, painting, sewing, weaving, and needlework. HUTS workshops are accessed through referrals from professionals such as GP, Community Mental Health Teams, Social Services, and other professional services. Socialisation through classes and workshops is becoming increasingly common within NHS services, known as social prescribing. NHS England estimates that 60% of Clinical Commissioning Groups (CCGs) have commissioned some form of social prescribing scheme, and preliminary research into its benefits are promising. For example, research found an average of 28% fewer GP consultations and 24% fewer attendances at A&E in instances where the person was engaging with social prescription. The outlines Bev was drawing for Angela started to attract compliments from her colleagues and, after painting a portrait of her recently deceased pet cat, she now takes commissions. "I have recently delivered two separate portraits of dogs that I was commissioned to do, and I have two more in the pipeline – another dog and a parrot. Bev says she’s thoroughly enjoying her job at Caeronnen which started in January 2018 when she relocated from South Wales to West Wales. She had spent the previous 18 months working in social care, before which she had spent 12 years as a teaching assistant, providing one-to-one support for pupils with special needs.